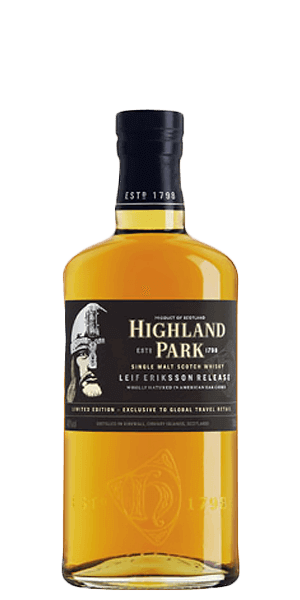 Highland Park Leif Eriksson is an Orkney single malt worth discovering. The Orkney Islands have always had a very strong influence of Norse culture and tradition. Highland Park Leif Eriksson is a tribute to the famous Norse Viking explorer who is said to have been the first European to reach North America — 500 years before Columbus. The Highland Park spirit that bears his name is a delicious NAS single malt originally available only in the travel retail market. Since Leif Eriksson may have “discovered” America, it is fitting that his Whisky is aged in a combination of ex-Bourbon and ex-Sherry casks from there. Smartass Corner: Highland Park Whiskies are not Highland-style single malts even though they have “Highland” in their name. Highland Park gets its name for a city district on the island of Orkney. What does Highland Park Leif Eriksson taste like? The Flavor Spiral™ shows the most common flavors that you'll taste in Highland Park Leif Eriksson and gives you a chance to have a taste of it before actually tasting it. Yellow color, spicy, little honey, vanilla, dried oak, hint of grape.